Like the larger iPad Pro, the 9.7" iPad Pro uses Apple's A9X SoC. Apple is never very forthcoming with details like the clock speed for the CPU, GPU, and amount of DRAM. What we can determine about the SoC is that Apple has maintained the 2.2GHz maximum clock speed from the larger iPad Pro, while reducing clocks on the GPU and dropping to 2GB of LPDDR4 RAM. The RAM situation on the 9.7" iPad Pro is somewhat surprising for a few different reasons. In their always-excellent teardown, the iFixit crew discovered that the smaller iPad Pro only had one Samsung 2GB LPDDR4 memory chip. This explains how Apple scaled down from 4GB to 2GB - the larger iPad Pro had two chips - but it also means that Apple has changed the amount of memory bandwidth available to the A9X SoC as well. To date, all Apple X-series SoCs have shipped with a larger 128-bit memory bus, and until now, Apple always fully populated that bus. So the 9.7" iPad Pro is an outlier in that regard, as this is the first time we've seen an X-series SoC with only the first 64-bit half wired up to a single memory chip in this fashion. 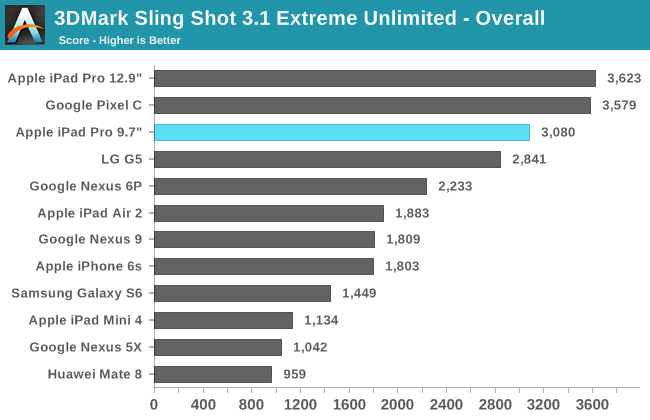 In that respect it's a surprising decision from Apple, in part because of the importance of memory bandwidth in feeding the large, powerful GPUs on the X-series SoCs. Consequently there is going to be more to the 9.7" iPad Pro than just the original Pro in a smaller chassis. 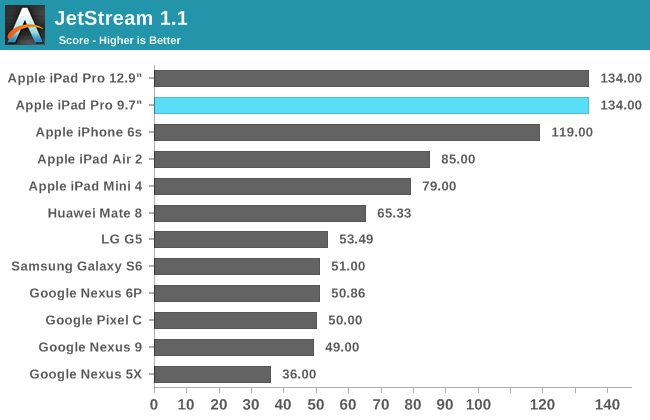 The 9.7" iPad Pro should match the larger model in anything that depends heavily on CPU speed or memory bandwidth, while falling behind to some degree in GPU-bound tests. The 12 cluster PowerVR Series7XT GPU inside A9X will be having to make do with less memory bandwidth, though offset to some degree by the lower resolution of the screen. With the above in mind, I quickly benchmarked the 9.7" iPad Pro on a couple of our memory bandwidth benchmarks. The results are somewhat inconclusive. 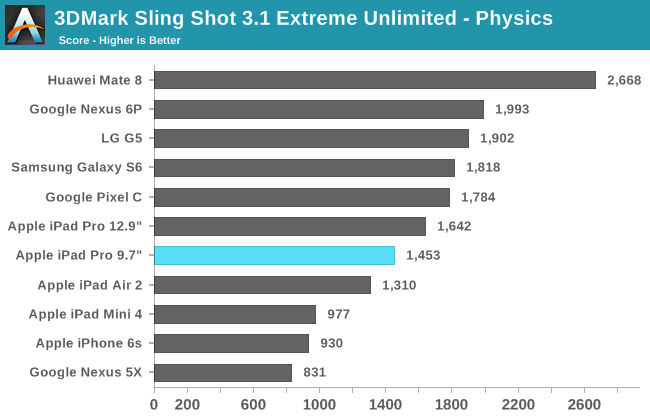 I say "inconclusive" because although the 9.7" iPad Pro consistenly scores lower in Geekbench 3's memory bandwidth benchmarks and other memory benchmarks, it's never a 50% drop as we get on paper. 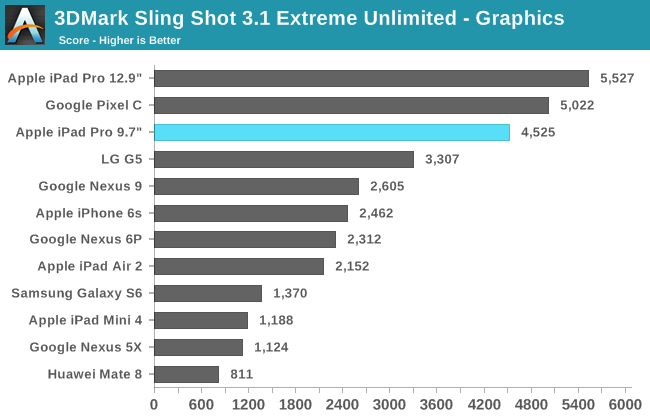 In practice these numbers are far from the maximum memory bandwidth A9X is capable of, and I suspect that the CPU paths simply aren't wired in such a fashion that they can fully saturate A9X, especially given the fact that it's the GPU that needs the bandwidth more. So although we see some impact of the narrower memory bus in dedicated memory bandwidth benchmarks, these can't paint a very clear picture. It's going to be our high level GPU performance benchmarks that really give us an idea of the impact of reduced memory bandwidth. 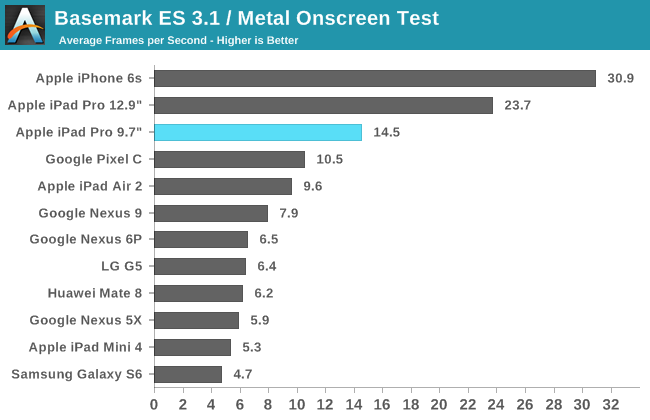 The 9.7" iPad Pro does well in 3DMark's graphics test, but like Ice Storm it doesn't do well in the physics test. It seems that this test is programmed in a similar way to Ice Storm, and in that sense I'm not sure how representative the physics test is of real-world performance because with an actual mobile game you wouldn't use highly random memory access and data structures with heavy memory dependencies when it would perform very poorly on your target devices. 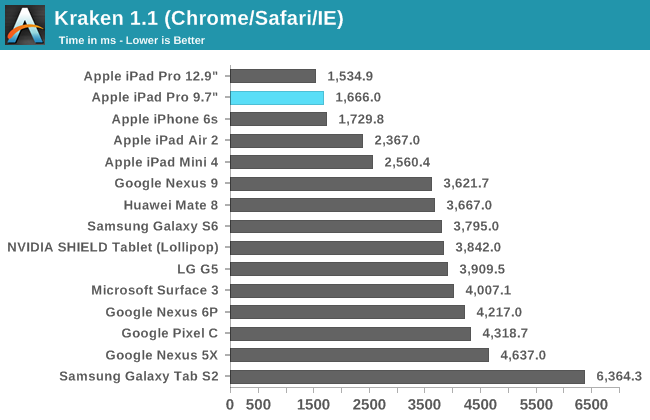 In any case, you can see that the 9.7" iPad Pro places third overall, with the 12.9" model at the top of the chart and the Pixel C coming right behind it. 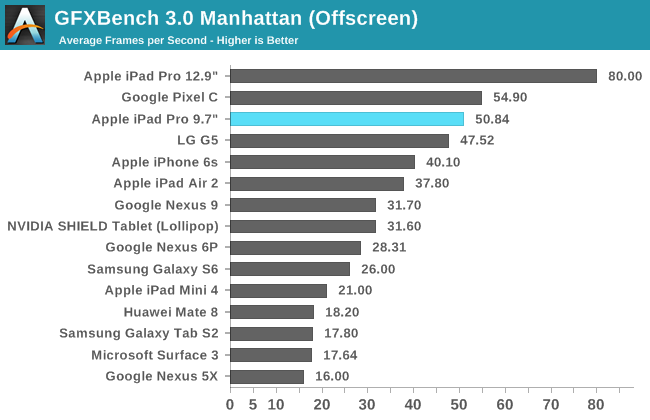 GFXBench 4.0 Car Chase hasn't made its way to iOS yet, and so for now we're still using GFXBench 3.0 Manhattan for iOS devices. Given that the iPhone 6s is the only phone that hits Vsync in this test, it's still a very relevant benchmark in how it represents the level of visual fidelity that a mobile game can currently have on high end devices while still performing well. In the off screen test we can see the impact of the 9.7" iPad Pro's lower clocked GPU combined with the reduced memory bandwidth,, with the smaller iPad performing around 37% lower than that of the 12.9" iPad Pro. The on screen test tells an interesting story though. Both models of the iPad Pro have roughly the same performance at their native resolutions in this test, which could indicate that Apple was targeting the same performance relative to the display resolution when configuring A9X and its memory, in order to manage heat and energy usage in a smaller iPad Pro. 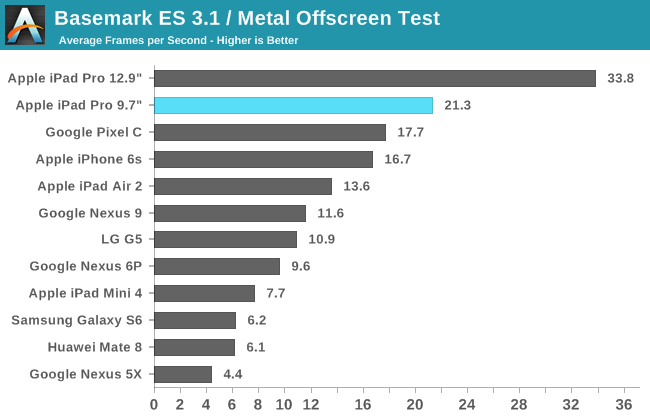 While I didn't have enough data to use BaseMark ES 3.1 at the time of my iPhone SE review, we've since tested enough older devices to deploy it. One could think of this as the successor to BaseMark X, which we retired some time ago before we officially deployed a new mobile test suite for 2016. 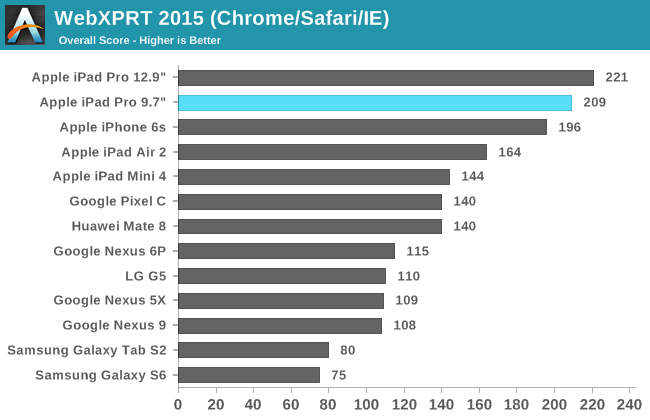 Once again, both models of the iPad Pro sit above the other tablets on the chart. 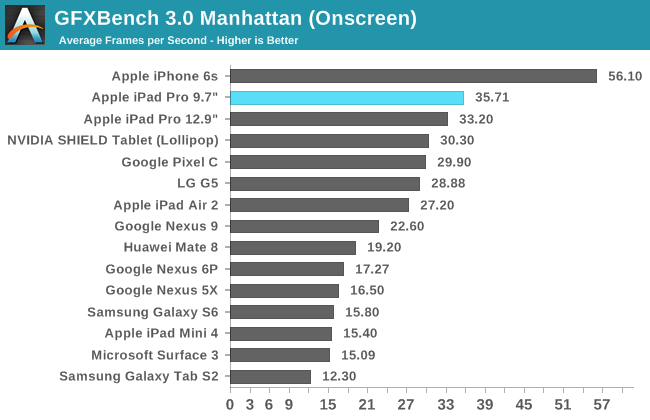 The iPhone 6s places first in the on screen test due to its relatively low resolution, but without that there the iPads would hold the top two spots in both tests. 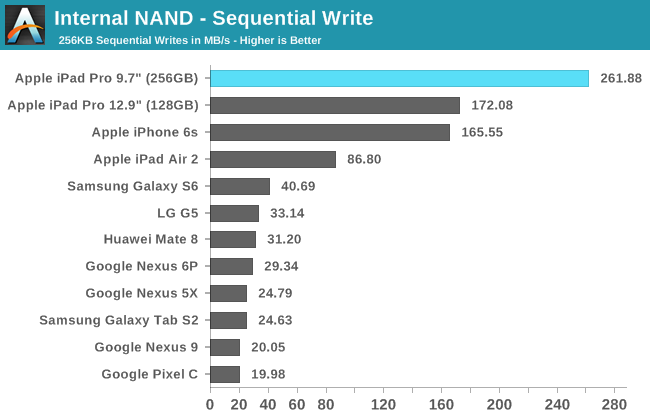 Something that Apple publicized with their A9 and A9X SoCs is improved NAND performance. NAND performance isn't discussed very much in reviews, but it's a very critical aspect of device performance and issues with it tend to cause a device's performance to crash months down the line rather than right off the bat, which makes it something of an invisible problem if you don't look for it during a review. We've seen previously that Apple has been using their own SSD controller in the current generation of iOS devices, and the 9.7" iPad Pro continues this. For this review I was sampled the 256GB model of the 9.7" iPad Pro. 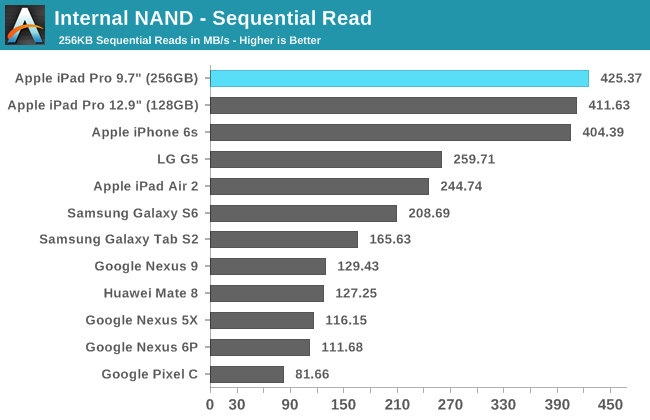 Because SSDs exploit parallelism heavily to improve performance, a 256GB iPad could improve NAND write performance over the lower-capacity models if it has a greater number of dies. In this case we see that sequential read performance improves a bit, while sequential writes improve dramatically as expected. There's not a lot to say here, as Apple has an enormous lead over the competition in this area. I'm still sort of surprised it was Microsoft that gave us the first really successful full PC in a tablet...although in another way I'm not, given Microsoft's actually been trying to do that for like a decade prior to the Surface line. I'm so annoyed by Apple/Apple fan's claims that Windows 10 "isn't good at either!" Nonsense. I've been using Windows 8/10 on a desktop for years, and I still prefer it to OS X, and I've been using it with touch for years, and it works well there too.